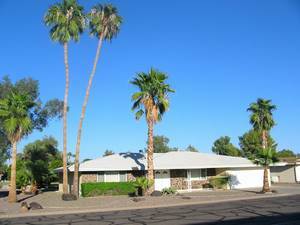 Very nice home at AZ Golf Resort near recreation, shopping, great inexpensive fine dining and entertainment. Home has large rooms and is very nicely furnished. Almost 2000 sq. 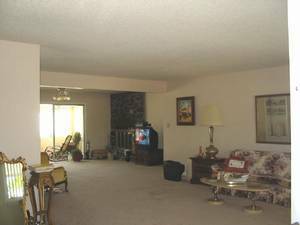 ft, 2 large bedrooms, 2 baths, great room, AZ family room/lanai, 3 patios, large fairway exposure on the back. Oversized garage with large laundry room and workshop. 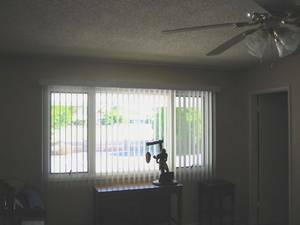 All utilities provided, including phone, 200+ channels digital cable with premium stations, and hi-speed internet (computer provided). Very quiet, secure area, wide, low traffic, well lit streets for biking or walking. 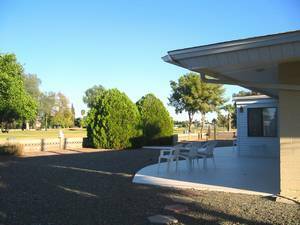 Close to Highway 60, approximately 30 minutes to Phoenix Skyharbor, short drive to Scottsdale, mountain lakes, Apache Junction, renaissance festival and many activities. One of views from backyard.. great area for chattin in the evenings or sipping cocktails! Home is exceptionally clean. Only one small, clean pet is allowed. Check with owner for conditions. 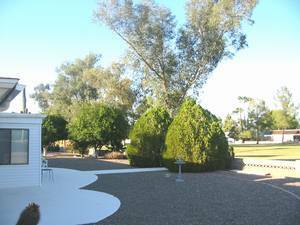 Guests are welcome to use all amenities including golf clubs, spices, tools, etc. Cancellations and Refunds: $1000 of deposit will not be refunded if guests cancel or do not appear. Other Fees: Home to be left as found. Additional $150 carpet cleaning for small pet.